After Tim Burton’s less-than-stellar Planet of the Apes rehash in 2001, many fans were understandably wary when, barely a decade later, the franchise got the reboot treatment one more time. But it turns out there was no reason to be afraid, since both 2011’s Rise of the Planet of the Apes and this past summer’s Dawn of the Planet of the Apes are fantastic and we can’t wait until the next one, already scheduled to open July 29, 2016. The original ending of Rise, however, was very different, and now we’ve got a description, as well as some concept art of the proposed finale. Spoilers lurk beyond if you haven’t seen Rise, but at this point that’s really on you. You should check it out, it’s awesome. One of the more striking images of this summer’s Dawn of the Planet of the Apes was one that dominated much of the marketing campaign: that close-up of Caesar’s mug, scowling and sporting war paint. It cut an intimidating figure, and the use of the paint was a nice, subtle way to remind audiences that the apes have come a long way in creating their own culture since first getting their intelligence jump-started in 2011’s Rise of the Planet of the Apes. 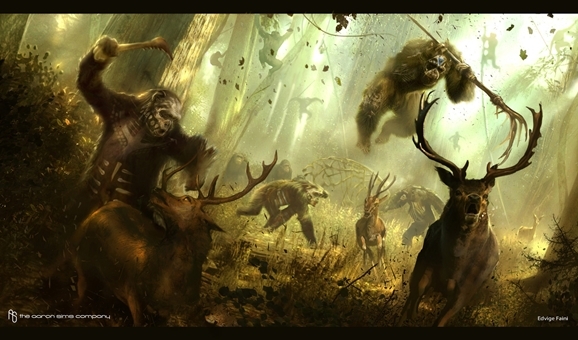 Looking at this stunning batch of Apes concept art, it’s clear that the war paint was an element that the filmmakers responded to strongly as well. You know what your Blu-ray shelf is lacking? A scowling ape’s head. I feel pretty confident in declaring that, but if I’m wrong, then I congratulate you for being ahead of the scowling-ape-head curve. 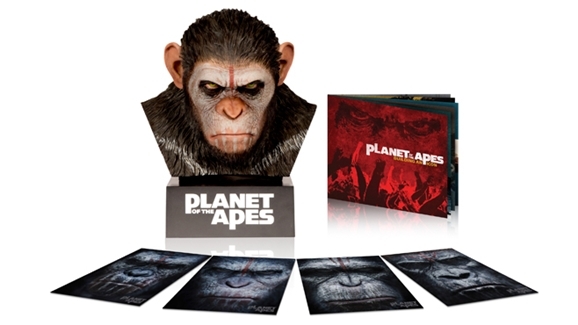 As for the rest of us, we’ll be able to remedy our scowling-ape-head deficit with the rather snazzy Caesar’s Warrior Collection Blu-ray set, which packs all sorts of goodies into a replica of Caesar’s intimidating mug. It’s available for pre-order this week both at Comic-Con and online, so now you folks in the midst of the San Diego chaos have a good reason to swing by the Fox Booth (#4229). The Caesar’s Warrior Collection is a four-disc set that will include Blu-ray 3-D, Blu-ray, and Digital HD versions of both Rise of the Planet of the Apes and Dawn of the Planet of the Apes, as well as “hours of special features.” The Warrior Collection also includes four collectible character cards and a 32-page “Planet of the Apes: Building an Icon” booklet that looks at WETA’s creation of the Caesar replica. The set lists for $129, but you can pre-order it now at Fox’s Comic-Con booth or via FoxConnect for only $99. There’s no official release date yet, but the set will apparently be arriving in time for the holiday season. In 2011, the prequel Rise of the Planet of the Apes was expected to be a lackluster, unnecessary, and dull entry in the science fiction film franchise. However, once it was released and people actually watched the film, it was clear that Rise was a special movie-going experience. 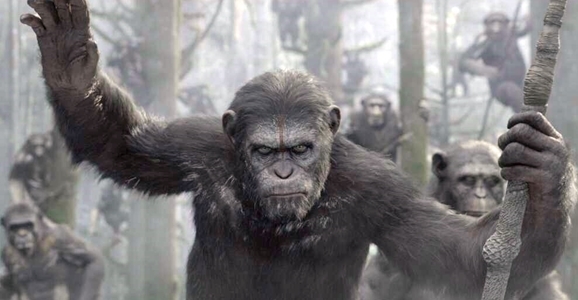 A majority of the surprise success of the prequel film can be attributed to the film’s director, Rupert Wyatt, as well as Andy Serkis’ brilliant performance as the uplifted ape Caesar. Dawn of the Planet of the Apes isn’t due in theaters until July 2014, but now animatics from Rise have popped up online, featuring two unused scenes from the film. Rise of the Planet of the Apes was one of last summer’s biggest surprises. It looked like just another ill-advised attempt to combine two of modern cinema’s most pernicious trends: the prequel and the reboot. Plus, many of us still had yet to shake the bitter taste of Tim Burton’s Apes miscarriage. Against all odds, however, it proved to be a surprisingly smart and enjoyable look at the very earliest origins of those “damn dirty apes” that bedeviled Charlton Heston way back in 1968. Now Warren Drummond, one of the artists who worked on Rise, has shared a set of storyboards that lay out a different version of the film’s opening sequence. He shared the storyboards with Filmsketchr, who edited them together into a snazzy YouTube video. You can check it out below, or click over to Filmsketchr to examine them individually.